Sprint times again provided by Jan at WorldOfX.com. The times kind of bounced around in this race. Normally the men’s qualification round is somewhat faster than this, relative to the times for the whole day. This might be related to either the course or the fact that in a WSC race you actually have a slightly weaker field due to the big nations (Norway, Sweden, etc.) being limited to only entering 4-5 athletes. 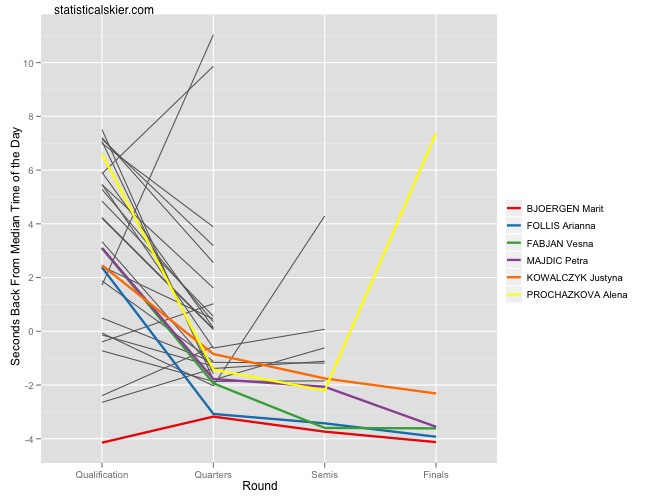 In either case, we have Jesper Modin again putting in a strong performance early, only to fade by the finals (but at least not finishing last in the final like he has so many times before this season). Still, Modin I think has gone somewhat overlooked among sprinters this season. He always seems to be there, he just needs to get his stamina up a bit so he can be more competitive late in the day. 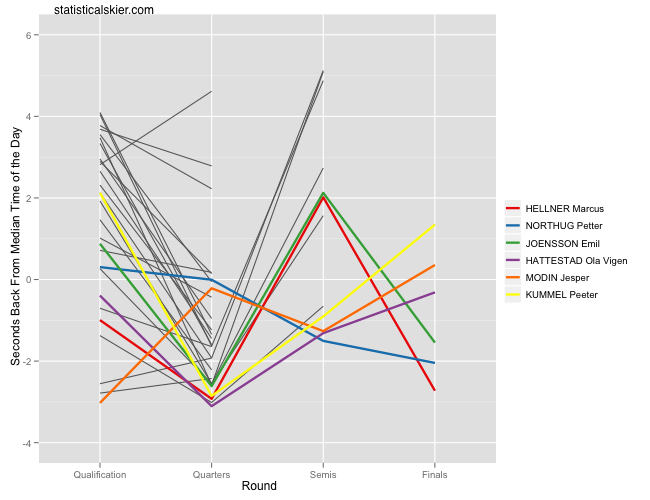 Notice Northug skiing steadily faster through each round, while the others bounce around a bit. Hellner and Jönsson skiing fast in the quarters, then lucking into a slow, slow semi and then of course turning it on again in the finals. Wow. Semifinal 2 was almost 4 seconds slower; hard to say whether those extra four seconds helped the Swedes Hellner and Jönsson in the final, but it couldn’t have hurt. Only Northug seemed to have handled the fast time in Semifinal 1 well, but then he landed in a fairly slow quarterfinal as well. 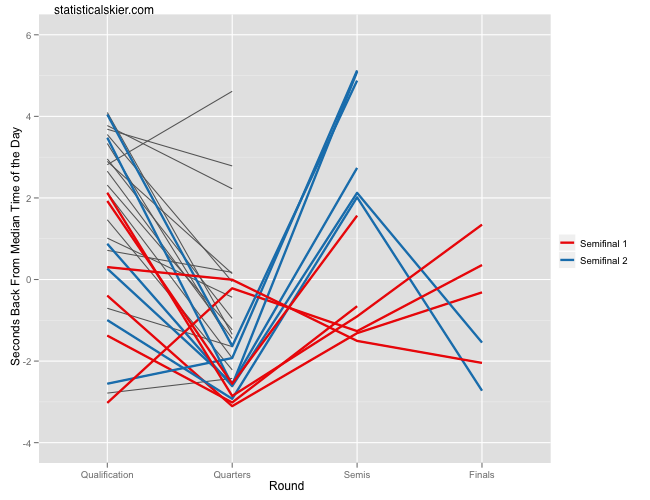 This is more of a typical pattern for the women’s heats: slowish qualification followed by progressively faster heats. Björgen was in control pretty much all day. Sprinting is still unpredictable, and there are clearly several other skiers who have the potential to match her speed in any given round (Randall, Follis, etc.) so I wouldn’t really expect her to dominate sprint races like she does the distance events. 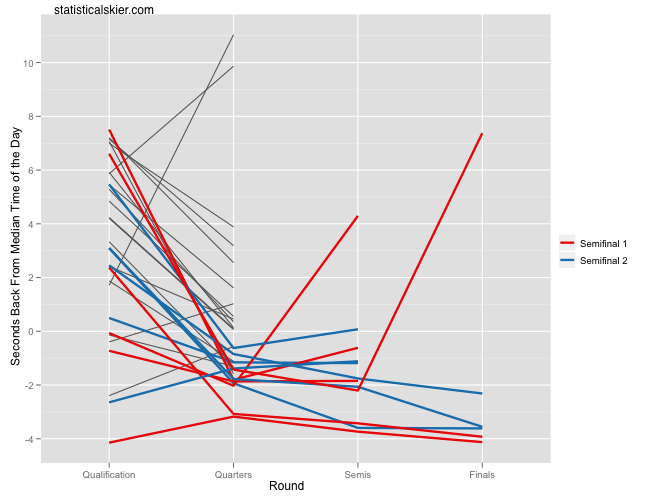 Semifinal 2 was probably slightly slower, but only barely, and there was much more overlap. Alright, on to the distance races…! Posted by Joran on Friday, February 25, 2011, at 6:00 am. Filed under Uncategorized. Tagged freestyle, oslo, recap, Sprint, WSC. Follow any responses to this post with its comments RSS feed. You can post a comment or trackback from your blog.